Save your skin, save your life, save the trouble of long hospital stays and therapy! In 2007, motorcycle rider fatalities increased for the tenth straight year. During 2007, 5,154 motorcyclists lost their lives in fatal highway crashes. Fifty percent of all motorcycles involved in fatal crashes collided with another type of motor vehicle in transport. In two-vehicle crashes, 78 percent of the motorcycles involved were struck in the front. Only 5 percent were struck in the rear. Over, 90 percent of all two-vehicle crashes involving a motorcycle and a passenger vehicle in which the motorcycle rider died occurred on non-interstate roadways. Fifty percent or more of all two-vehicle crashes involving a motorcycle and a passenger vehicle in which the motorcycle rider died were intersection crashes. In 2007, there were 2,332 two-vehicle fatal crashes involving a motorcycle and another type of vehicle. In 40 percent of these crashes, the other vehicle was turning left while the motorcycle was going straight, passing, or overtaking the vehicle. More information at www.nhtsa.dot.gov or www.msf-usa.org. BORROWING AND LENDING...DON’T DO IT! GET YOUR OWN BIKE! BUT, IF FOR SOME REASON YOU’RE TEMPTED TO BORROW OR LOAN, HERE’S SOME ADVICE FROM THE NORTH CAROLINA DEPARTMENT OF TRANSPORTATION (helpful no matter where you live). CHARLESTON - A motorcycle rights group is supporting a Senate bill that lets bikers treat sensor-controlled red lights like stop signs. Motorcycles and even small cars often aren't detected by sensors at automated intersections, so riders either sit there until a car comes along - which can take seemingly forever at rural crossings - or break the law by turning right then looping around and turning right again at the green light. "There's a little red-light motorcycle dance that goes on sometimes," said Ed Haas, media coordinator for the motorcycle group A Brotherhood Against Totalitarian Enactments of South Carolina, or ABATE. "Any law that forces people to occasionally break it is problematic and probably should be reworded." ABATE endorsed the bill co-sponsored by Sens. Phil Leventis, D-Sumter, and Jake Knotts, R-West Columbia, which lets bikers continue if a traffic sensor fails to detect their motorcycle or mo-ped and they've sat at the intersection at least 20 seconds. "This is a no-cost solution to a problem that affects some of the 100,000 motorcyclists in South Carolina on a daily basis," Dennis Welborn, a legislative coordinator with ABATE, said in a news release. Fred Rosendahl, a traffic engineer for North Carolina's Department of Transportation and a member of its motorcycle safety committee, said changing the law is a bad idea. "It breeds disrespect for adherence to traffic controls," he said. Rather than let bikers pass through red lights, the Transportation Department should ensure the sensors work properly, he said. Knotts said the proposal, introduced Jan. 10, is "just a way to allow people who wait at these lights for long periods of time to avoid breaking the law." "If they get hit going through the intersection, it's their fault," he said. Preliminary figures from the state Department of Public Safety show 90 motorcycle fatalities and 1,140 injuries in 2005. The department reported 92 fatalities and 1,386 injuries in 2004. Ninety-three bikers were killed and 1,182 injured in 2003. Motorcycle rider Craig Partridge of Hollywood, in rural Charleston County, said he already uses the stop-look-go method at certain traffic signals. "That's working real good for me already," he said. Article from thetimesherald.com - Michigan law rightly requires riders to wear protective helmets. The count keeps growing. A motorcyclist was killed on M-19 in Emmett Township. Jeffrey Lawrence Rousseau, 40, of Caro was hit head-on by a motorist trying to pass a tractor-trailer at about 8 p.m. Thursday, September 8th. The fatality is part of a troubling increase in deadly motorcycle accidents - in the Blue Water Area and the state. Michigan's number of serious injuries and fatalities is on the rise, according to the Michigan State Police. The same trend is reflected nationally. For seven consecutive years, the number of motorcycle-rider fatalities has grown. For the first time since 1987, motorcycle deaths exceeded 4,000. They clearly illustrate the risk motorcyclists assume simply by driving the same streets and highways cars and trucks dominate. More than anything, though, the fatalities reiterate what a folly it would be to repeal Michigan's mandatory helmet law. * Head injury is the leading cause of death in motorcycle accidents. A motorcycle rider is about 21 times more likely to die in a crash than someone riding in an automobile. * Riding a motorcycle without a helmet makes it 40% more likely to suffer a fatal injury in a crash. * Helmets reduce the chances of dying in a motorcycle accident by 29%. * According to the state Office of Highway Safety Planning, there were 3,187 motorcycle accidents in Michigan in 2003. Seventy-six resulted in death. * A 2004 study by the Michigan State Police and office of Highway Safety Planning projects another 22 fatalities a year if the state's helmet law is repealed. The study also predicts 132 more incapacitating injuries and $140 million in economic costs to state residents annually if the helmet law is repealed. Motorcycles are enjoying a marked increase in popularity. The rising price of gasoline and motorcycles' attraction to the baby-boom generation are two considerable factors. At the same time, mandatory helmet laws aren't universal. Colorado, Illinois, Iowa and New Hampshire don't have them. While 20 states, including Michigan, have mandatory helmet laws, 26 states only have partial laws that usually require riders younger than 18 to wear helmets. The danger, already quantified by state and national statistics, clearly is greater when motorcyclists forego their helmets. The safety burden obviously isn't exclusive to motorcyclists. Conventional- vehicle drivers must take greater care, particularly when they share the road with motorcycles. Too often, car-motorcycle accidents occur because drivers never see the motorcyclists. The latter, however, are the ones who end up paying for those mistakes - sometimes with their lives. Motorcyclists shouldn't be without their helmets. Tokyo, Japan (article from www.world.honda.com)- Honda Motor Co., Ltd. today announced it has succeeded in developing the world’s first production motorcycle airbag system. The new system, which can help lessen the severity of injuries caused by frontal collisions, is to be made available on the new Gold Wing motorcycle scheduled for release in late spring of 2006 in the US. The Motorcycle Airbag System is comprised of the airbag module, which includes the airbag and the inflator; crash sensors, which monitor acceleration changes; and an ECU, which performs calculations to instantly determine when a collision is occurring. When a severe frontal collision occurs, the four crash sensors mounted on the front fork measure the change in acceleration caused by the impact and convey this data to the airbag ECU, which determines that a collision is occurring and whether or not it is necessary to inflate the airbag. If the calculations performed by the ECU indicate that airbag deployment is necessary, the ECU sends an electronic signal to the airbag inflator, which instantaneously responds by inflating the airbag. 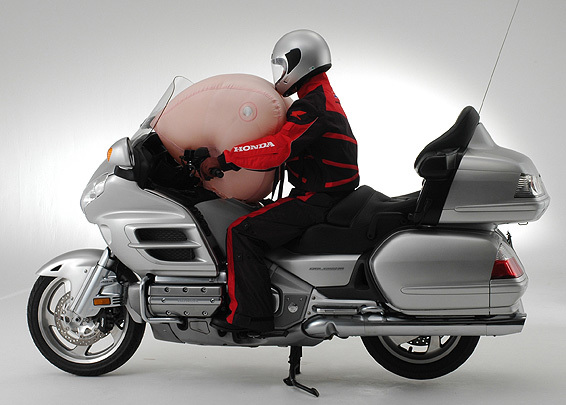 Inflating rapidly after the impact, the airbag can absorb some of the forward energy of the rider, reducing the velocity at which the rider may be thrown from the motorcycle and helping lessen the severity of injuries caused by the rider colliding with another vehicle or with the road. By conducting extensive crash tests at its indoor omni-directional Real World Crash Test Facility, applying advanced computer simulation technology, and leading the way with the introduction of motorcycle rider test dummies, Honda has gathered and analyzed a wide array of data on the behavior of motorcycles during collisions. Honda has also taken full advantage of the experience of its automobile operations in the development of airbags, applying its expertise in the development of the Motorcycle Airbag System. 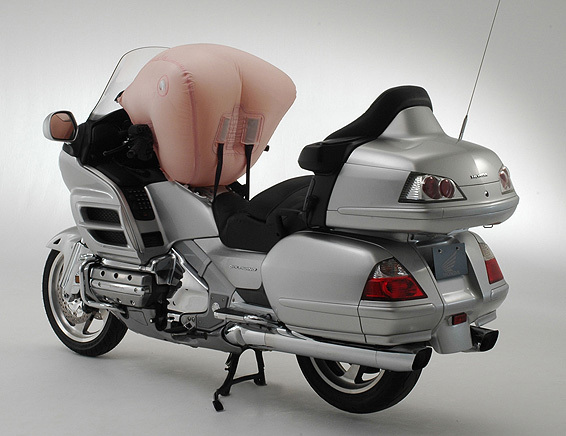 The airbag module, containing the airbag and inflator, is positioned in front of the rider. The airbag ECU, positioned to the right of the module , analyzes signals from the crash sensors to determine whether or not to inflate the airbag. Four crash sensors attached on both sides of the front fork detect changes in acceleration caused by frontal impacts. The airbag module contains the airbag and airbag inflator. The airbag inflator receives an electronic signal transmitted by the airbag ECU instructing it to release nitrogen gas to inflate the airbag. 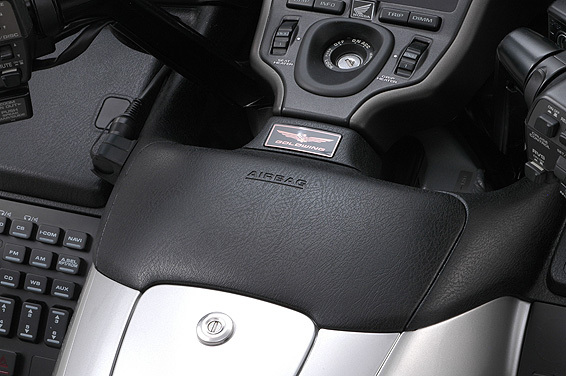 The airbag starts to inflate, exerting pressure on the cover of the airbag module, forcing it to open. The size and shape of the airbag, the manner in which is secured to the motorcycle with tethers, and the function of the deflation vents all help to maximize the effectiveness with which the system absorbs the kinetic energy of the rider, helping control the velocity at which the rider may tend to be thrown forward from the motorcycle, and thus lessening the severity of any injuries resulting from impact with another vehicle or with the road. From the moment an impact is recognized as a collision to the moment of airbag inflation, only 0.060*1seconds elapses. The airbag ECU continuously monitors the data received from the crash sensors, and by comparing this data to standard vehicle behavior, determines whether or not it is necessary to deploy the airbag. The data from each sensor is evaluated independently, and if it is determined to deviate from programmed standards of safe vehicle behavior by a certain predetermined degree, an electronic signal is sent to the airbag inflator, which causes the airbag to inflate. The crash sensors which monitor acceleration changes are attached to the front fork legs to optimize the quickness and accuracy of their detection of frontal impacts. No alteration of the structure of the motorcycle is needed. To optimize the accuracy of collision detection, a set of 4 sensors are arranged—two on each side of the front fork.